The Dream Machine as seen in the storyline of Yume Kōjō: Doki Doki Panic. Sprite from Super Mario Advance. 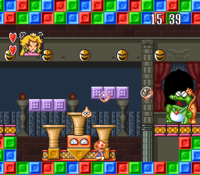 The Dream Machine is a machine used by Wart prior to the events of the non-Mario game, Yume Kōjō: Doki Doki Panic, and the Mario version, Super Mario Bros. 2. The Dream Machine from Yume Kōjō: Doki Doki Panic. In Yume Kōjō: Doki Doki Panic, the Dream Machine is created by the Muu people to control the weather and sustain good dreams to all the inhabitants. Mamu (later renamed Wart) tampers with the Dream Machine to produce several monsters. The Muu people initially stop Mamu, but when the twins Piki and Poki accidentally rip out the last page of the book, Mamu attempts to rewrite the ending and kidnaps them. At the final battle, the Dream Machine creates turnips, which the twins' family has to throw four times in Mamu's open mouth in order to defeat him. In Super Mario Bros. 2, the Dream Machine plays an identical role, although its background as the prize of the peace-loving people is omitted from the story. It is still implied to create monsters that Wart then uses to increase the numbers of soldiers for the 8 bits and take control of Subcon. During the final battle, the Dream Machine shoots out vegetables, which are the only way to defeat Wart. The Dream Machine in BS Super Mario USA. The Dream Machine made its return in the pseudo-sequel, BS Super Mario USA. It only makes an appearance in Wart's secret room in a jar from Subspace that is almost identical to that of the factory's final room. The Dream Machine is used for the same purpose it had in the first game. ↑ "Here you are face to face with the big, ugly–Wart. The time has come for you to fight against the evil ruler of the World of Dreams. He’ll approach you spitting foam from his mouth. The Dream Machine will be shooting the vegetables he hates so much. Catch them and throw them at Wart!" - Super Mario Bros. 2 Inside Out, Part II. Page 34. ↑ "Wart is the most uncontrollable mischief maker in all of the land of dreams. He uses the Dream Machine to create a myriad of monsters." - Super Mario Advance North American instruction booklet, page 35 (Wart description). ↑ Yume Kōjō: Doki Doki Panic instruction booklet, pages 6-7 & 36 (Mamu description). This page was last edited on December 5, 2018, at 17:08.